Stephanie was an absolute DREAM to work with for our engagement session and wedding photography. 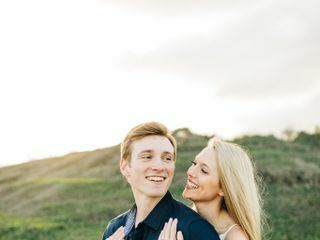 Conner and I knew Stephanie from high school - she was always supportive of our love story and continually expressed her interest in photographing us whenever the time came for our special day! t's hard to even put into words how incredible her work truly is. She has an eye and unique style that is can't go unnoticed. 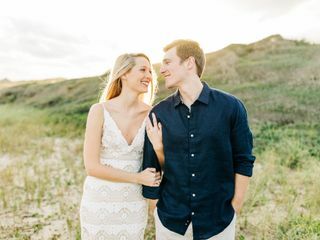 The engagement shoot allowed Conner and I to get comfortable in front of the camera together, being that it was the first time we ever had professional pictures taken together. We had a complete BLAST - laughing and smiling the entire time - which ensured that our wedding photos would turn out just as we envisioned. Whether you have had experience with that or not, Stephanie knows how to make you look amazing and capture your true self / relationship with your partner on camera! On our wedding day, Stephanie helped us stay on schedule while capturing every point in time of our day. This made us feel at ease, ensured everything ran smoothly, was fun and the pictures truly speak for themselves. If you want an incredible professional who can help create memories for you with passion, talent, and a personal touch, look no further than Stephanie Axtell Photography. She is responsive, will travel out of state (she did this for us! ), fun to work with, and has undeniable talent. My fiancé, Calvin, and I were so excited to get our pictures done at the beach. We absolutely love the beach and spend any free time at the beach. In fact, the beach is where I realized that I was falling for Calvin and knew he was going to be something special in my life. Anyway, we scheduled our pictures and then Mother Nature had other plans. Stephanie kept in contact all the way up to when the hurricane hit and then was very quick to reschedule our pictures, when we realized that the hurricane was going to hit the area. After the hurricane we had to switch our location for pictures because our original location wasn't a good spot after the hurricane and Stephanie recommend Fort Fisher. It was a great recommendation and the pictures turned out BEAUTIFUL. Stephanie had such a great personality and made us feel comfortable in front of the camera. Her technique to get the look she wanted were clever and had a way to turn the photoshoot into a new memory with stories to tell. A great picture tells has a way of telling a story and Stephanie definitely did that with our engagement pictures. She got all the pictures we wanted. The pictures she took for us turned out to be EVERYTHING WE WANTED AND MORE! I definitely recommend her to anyone in the area, or not in the area that want great pictures. I mean, we drove two hours down to the beach and two hours back for our engagement photos and it was SO WORTH IT! I'm so thrilled you both are in love with your photos (cause I am too!) I can't thank you enough for allowing me to capture these moments for you! This is what I love to do!!! Hiring Stephanie was the best decision I could have made. She is so talented, and easy to work with. She gives you direction, and the photos from our engagement photo session came out beyond my greatest expectations. I am so excited to continue working with Stephanie for my bridal portraits and our wedding!! Choosing Stephanie to be our wedding photographer was the easiest decision my fiance and I have made on our wedding planning journey thus far. Stephanie is warm and funny but also professional- you can tell right away that she has a true heart to capture the love between the couples she photographs. The first time I met her was at our engagement session, and she immediately made me feel comfortable and known. And she took the best pictures of my fiance!! He hates getting his picture taken, and Stephanie set him at ease and made us laugh. Stephanie traveled to the location of our choice and spent over 2 hours with us. I feel confident that come my wedding day, I can truly be present in the moment because I trust Stephanie to capture it all. I could not recommend her enough. Stephanie was amazing! She was super accommodating and our pictures turned out beautifully. She did our engagement session too and I felt like she really got to know us, which helped her create these amazing photos. I will definitely be reaching out for any future photography needs! Excellent wedding photos. Stephanie is priced fair and does great work. She shot our engagement photos and wedding photos. Both turned out awesome! She used a second photographer (as is pretty much protocall) and captured some really cool moments. We had an extensive shot list and although it burdened her quite a bit, she was able to accomodate our shot list as well as add her own creative shots for our wedding pictures. She communicated well before the event and more importantly, on the day of our wedding. We found her very easy to talk to and communicate with, although she took charge in the few moments she needed to in order to get some solid photos. Overall she did and excellent job and we would recommend her to future couples looking for a photographer who communicates well, and takes incredible photos. Stephanie was very knowledgeable about photography and so easy to talk to! Her Portfolio was spectacular, and she is flexible with providing you exactly what you want! I look forward to her photographing my wedding! Oh my goodness thank you so much! I'm glad we had such a great 1st impression and I cant wait to work with you! My husband and I hired Stephanie for our wedding, and we could not have made a better decision! 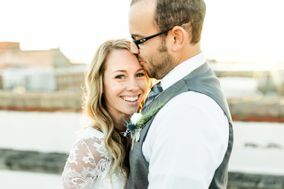 We met with many photographers before her, but her professionalism, sweet personality, and beautiful photos won us over! She shot our engagement session, my boudoir shoot, and our wedding. She made us feel so comfortable, made us laugh, and truly captured our personalities and our love. She got our photos back to us so quickly for our engagement and my boudoir shoot. She also gave us a preview of about 50 wedding photos the day after our wedding. I would absolutely recommend Stephanie to any engaged couples! Great experience! Can’t wait to see all of our wedding pictures. If you are looking for an amazing photographer you have found her! I searched for months to be sure I found someone that would be a good fit for both mine & my husband’s personality & we’re so happy we found Stephanie! I could not be more in love with our wedding pics, including our engagement & my bridal session. Stephanie is beyond talented & was able to capture photos that I never could have imagined. I can’t thank her enough & highly recommend using her for your next photographer!!! Ashley I can't tell you how happy it makes me to hear that you took so much time to find us - your wedding was so special for so many reasons, but it just stands out to me how much you two love each other! It made our jobs so easy and your wedding photos insanely beautiful! Thank you, thank you, thank you again for allowing us to be there for your wedding! I absolutely loved working with Stephanie for my wedding. She was extremely professional but also fun and made taking pictures enjoyable. She was flexible by adjusting her package offerings to fit my budget. I ADORE my wedding pictures! Thank you so so much Christin! You two were a blast to work with and had such a beautiful wedding - we're so thankful to have been a witness to your wedding day! Stephanie and Charles did an amazing job with our wedding video and we could not have been more pleased with it! We received our 5+ minute wedding video plus a 10+ minute video of the ceremony in well under 2 months which was a couple weeks under what we got promised on and we have been watching it multiple times a day ever since! They captured all of the best parts of the day and even included a couple sentimental moments that meant the world to my wife and I but would probably go unnoticed to most. Even the music fit us perfect! In fact, Stephanie sent us the video and we had one minor request to change and she did it that night! As for the wedding day, we barely even noticed they were there to do videography for us. They were both so personable and friendly that they felt like part of the family. They let us be ourselves and made themselves fit perfectly into the days timeline. We were never once stressed about anything and they were both extremely polite. After seeing the few minutes of short videos, they will make you wish you had them do the whole night! If you’re looking for a fun, flexible, and extremely professional videographer, than Stephanie is the one for you. Thanks you both again so much! WOW!! I don't even know what to say - this is so wonderful of you to share and i'm literally speechless! We were so happy when you called us looking for a videographer - and we're so thrilled we could do this for you both! Thank you so much again for allowing us to be there and I wish you both a lifetime of love and happiness! Stephanie was so great to work with! There are not enough adjectives to describe our experience with her! Super knowledgeable, helpful, kind, caring, and high quality work at a great price! We are able to re-live our wedding through the pictures she took! We look forward to using Stephanie again in the future! Stephanie was wonderful to work with! She was amazing at capturing my wedding. I chose her for her natural light photography and she did not disappoint. Stephanie captured photos that I never thought I would get from my wedding based off of the location but she used the spaces to her advantage. She knew of a hidden garden downtown that allowed me to get great outside photos. Stephanie worked my wedding by herself since it was a smaller wedding and she stayed on time, captured photos throughout the ceremony that I did not think one person alone would be able to capture all in a short time period. She kept on hand some of my inspiration photos I gave her and used her knowledge to get a wide range of different photos. Stephanie was patient, funny and used great tactics to get us smiling and laughing for good candid shots. She also had my sneak peek to me within 48 hours! An engagement session was included in our wedding package and this showcased Stephanie’s amazing editing skills. The day was hot and super humid which led us to being a little sweaty. Stephanie was able to edit the sweat droplets off of our faces and our clothes, for a great outcome. I would definitely recommend Stephanie and I am beyond impressed with her professionalism and service! Oh hollie! What a wonderful review! I've been so excited with your photis that many are being featured in an upcoming bridal show - just like the one I met you at :) thank you so much for allowing me to be a small part of your wedding!! Stephanie was an absolute dream to work with before and on our wedding day. She was very flexible with customizing her services to fit our budget as well as our wants. 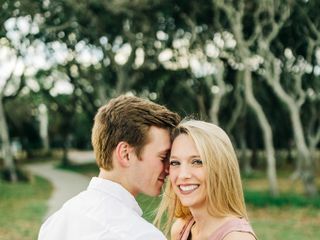 We scheduled a meeting prior to our wedding day to discuss what we wanted from our pictures and she was very engaging as well as helpful in talking through what her process would be. During the formal photos she was ingenious in eliciting reactions from even the most photo-averse groomsmen, resulting in the most beautiful photos of all the people we love! And to top it off, she got us a preview of our photos THE DAY AFTER our wedding. Stephanie is incredibly professional and a genuinely lovely person, I would recommend her to anyone without hesitation! Thank you so much, Morgan!!! You'll never know how much it meant to have me cover your wedding! I wish you two a lifetime of love and laughter! I am so glad we chose Stephanie to be our wedding photographer. She was amazing to work with from day one -super responsive, knowledgeable and friendly. And her work does not disappoint -she is an incredible photographer. We are super happy with how our wedding photos have turned out so far. We highly recommend her!! Stephanie was absolutely amazing! I literally can not say enough great things about her! I had several photo shoots with her (engagement, boudoir, and bridal). I received my photos back in a timely manner and they were breathtaking! My husband is not photogenic and can become quite awkward infront of the camera but she even managed to make him feel at ease and capture great photos of him. Of all the photographers I contacted (which was a lot) Stephanie was the most professional and offered the best value hands down! She takes direction well. She took some of my ideas and ran with them and made them look even better than I imagined. I also hired her to do the videography at my wedding and I haven't gotten it back yet but I know it won't be anything less than amazing! I would highly recommend her and I know I will be using her again in the future for other photo sessions! Oh Laura!!! What wonderful words!!! I can't wait for you to see your video - its getting wrapped up as we speak! :) You are the kind of couple that makes all of this why we do what we do - we LOVED working with you!! We could not have asked for a better photographer! Stephanie's professionalism and dedication showed in every picture! She is wonderful at making everything go as smoothly on her part as possible and is amazing at capturing those perfect moments! If you're looking for someone personable and dedicated to capturing photos you will cherish for years to come this is your girl! Stephanie was absolutely amazing! She was there with me throughout the whole process of my wedding planning and wedding day to document everything. Before the wedding day, we did a boudoir and bridal shoot which were a ton of fun! Stephanie has a great way of getting you at your best! On our wedding day we worked with her and husband Charles and they were truly a wonderful and professional team! We are so thankful for the wonderful services she offered us and will be certain to use her for anymore of our photography needs! Oh thank you so much Elena!! It was such a pleasure to meet you and your husband and work with you throughout this year!! Stephanie captured my wedding day in ways I never could have imagined. She's amazing at being at the right place, at the right time, and knowing exactly how to capture the most important moments. My highlight video was the most beautiful I've ever seen. She sent me my finished wedding photos with different options for the best photos (some in black and white, some with less light, etc.) so I was able to pick the versions I liked best. She did not cut ANY corners. If you are considering hiring Stephanie, stop looking at other photographers. She's seriously the best decision you'll make for your wedding. If anyone ever wants to reach out, I'm happy to share her work and give a live recommendation; she was that good. Thank you again, Stephanie!!!!! Stephanie was absolutely amazing! She was extreme patient and kind with every interaction we had. She genuinely listened and it was very obvious she cared a great deal about us and the work she was doing. I would hire her again and again! We loved having Stephanie as our photographer. She was fun to work with and took great pictures. If I have another event where I need a photographer, I would have Stephanie do it again. I had a great experience with Stephanie! Originally I chose her because she was starting up her business and was a fellow military spouse, so I wanted to support her! I enjoyed that she let you customize her packages. Having Stephanie was one of the best decisions for our wedding! She captured gorgeous images and had a sneak peak preview within a couple days of the wedding! She was able to capture smiles of my husband (that NO ONE has been able to capture before). These will be images that I will hold close for the rest of our lives! Booked stephanie for wedding and reception and got a free engagement shoot with that package. She's open to be flexible with your budget, I highly recommend being open about your budget with her, she'll help you decide what to get for the best bang for your buck! Our engagement photos came out wonderful! And I cannot wait to see how the wedding photos turn out. Thanks stephanie!